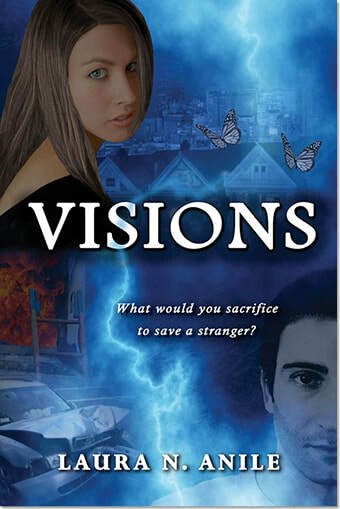 Visions is a novel that explores the ideas of fate and purpose, and how we are all connected. When you hold the power in your hands - do you choose your fate, or does your fate choose you? In exactly two minutes, there will be a gunshot. In exactly two minutes, everything will change. In exactly two minutes, someone might die. ​Read the first chapter to find out how it all begins for Isabel. You can also read a teaser excerpt that's not available in the bookstore sample. “I’ve wanted you to monopolize me,” he said in a low voice, his salacious grin adding heat to his eyes. “What do you have in mind?” he asked in the same suggestive tone. “Whatever you want,” I played along. “So what exactly do you have in mind?” I asked coyly. “Be at my place at eight. The rest of the evening will be a surprise.” He paused, cocking his head. “Anything goes,” he teased, a dangerous glint in his eye. “Not as much as I am, my slave girl,” he chuckled, his brows dancing. His laugh didn’t subdue my nerves—there was something devious in it. I snuggled closer to him and breathed in his familiar scent. “I might give you a preview,” he murmured in my ear, his voice deepening as he tugged me to the bedroom and pulled me onto the bed. A wave of heat immediately ignited within me and my hands found their way under his clothes. The feel of his skin against mine, his body moving with mine, took my breath away. Later, I fell asleep in his arms, my last thoughts of the unbridled anticipation of whatever he had in store for the following evening. It started as it usually did. Me looking down at the multiple-choice test with his hand on my shoulder. But then the scene shifted and I was no longer in the exam room looking at a piece of paper. A piece of paper couldn’t physically hurt me; what was now in front of me could. Absolutely terrified, I dared to take a glimpse at the man holding the gun. He was dressed all in black, wearing a riding jacket over a T-shirt and jeans. His face was completely obscured by the black helmet he wore. I glanced behind him and saw my terror reflected back at me in the eyes of the woman behind the teller. There were four other people in the bank, besides the three tellers. A woman, with a young girl who appeared to be between ten and twelve, and two men. One of the men looked to be in his forties, and wore a navy suit with a gold tie. The other was in a black suit with his back to me. The young girl began screaming; a scream that made your blood run cold. Her mother instantly tried to placate her, eventually smothering her mouth when those attempts failed. That only intensified the screaming, agitating the girl more. The gunman flew into a rage, demanding the girl be silenced before he silenced her. His hand twitched in fury. Could he honestly harm a child? I wondered, as fear crashed over me. The interminable screaming shrilled through the bank as the girl thrashed in her mother’s arms. My skin tingled, the air electrified with trepidation. The gunman pointed the weapon directly at the child, narrowing his eyes. Time slowed down, like someone hit pause. A feeling of complete and utter helplessness reverberated through me as I frantically scanned the room, searching for some kind of help to magically materialize. A number suddenly flickered in my vision, flashing like a number on a screen: 12.19. I blinked; it felt like a camera flash had just gone off in my eyes. Then I noticed the calendar. All I saw was Thursday before the scene began to move once more, still in slow motion. My attention instantly returned to the gunman. His finger inched towards the trigger. His whole body was shaking. Panic crippled me. This was it and I had no idea what to do. A growl erupted from the gunman’s throat as his feeble control shattered and his finger pulled back the trigger. There was no time left to decide, to think. There was only time to act. Instinctively, I jumped in front of the young girl as I heard the deafening crack of the gun being fired. I jumped so violently that I awoke, drenched in sweat. I couldn’t be dreaming; my eyes were open. But somehow what I was seeing was not the living room in my apartment, where I was sitting. I rubbed my eyes, trying to refocus. What on earth was going on? I could still hear the television, just a quiet humming in the background. All of the recent late hours at the office were clearly beginning to take their toll. It was night, the darkness cloaking someone standing in the shadows. I started to recognize the setting; it was the rooftop of my apartment building. I was disappointed in myself, if I was daydreaming so vividly (which I hoped I was doing, as opposed to potentially losing my mind), couldn’t I have come up with something a little more interesting? Walking along the Ponte Vecchio in Florence, visiting the Eiffel Tower in Paris or sitting on the London Eye perhaps? My rooftop wasn’t exactly a place I longed to visit. I pinched my eyes shut, but the image refused to fade. A shiver crawled up my spine. All of my internal alarm bells were ringing—loudly. Something wasn’t right. Keeping my eyes closed, I rubbed my temples and took a deep breath. Seeing something that wasn’t there felt a lot more disconcerting with my eyes open. The image became clearer, like I was suddenly thrust forward. I couldn’t escape it. I was held hostage inside my own mind. My heart was racing, along with my thoughts. Tensing, I tried to work out what my fragmented mind had mysteriously conjured. Who was that in front of me? From his stature and physique, I could tell it was a man, but his back was turned. I caught a glimpse of his face as he staggered, a half-empty bottle in his hand. I recognized him as my neighbor from across the hall. Jeremy was not much older than I was, in his late twenties or early thirties. Until about a month ago, he’d lived with his girlfriend, Becca. From what I could tell – the walls were quite thin and she never lowered her voice when she was worked up – she’d moved out a few weeks after he’d lost his job. Apparently, she didn’t like that they no longer ate in expensive restaurants or went clubbing; she’d said he wasn’t 'fun' anymore. Becca was a lot younger than Jeremy, and being supportive was evidently not her strong suit. He’d looked so defeated when I’d occasionally passed him in the hall. I wanted to tell him that it was only a rough patch, and things would look up. But we’d only ever exchanged pleasantries in the elevator and I didn’t want to pry, nor did I want to let on that I’d overheard their arguments. So I’d said nothing. Why on earth was I visualizing Jeremy on the roof? I pondered whether it was because I was subconsciously feeling guilty. I should try to talk to him. The image propelled me forward once more, making me dizzy. From this angle, I could see the moisture on his cheeks glistening in the moonlight. He took another swig from his bottle then pulled his phone out of his back pocket. Instead of making a call, he put on some music, turning the volume all the way up then setting the phone on the ledge in front of him. The music had a strong beat and soon he began to sway to the music. But his balance clearly wasn’t what it should’ve been, and he was stumbling more than dancing. My drunken neighbor throwing a party-of-one on the roof. Not exactly riveting. I tried to break free of my mental prison. I rubbed my eyes again, channeling all of my thoughts into a mental picture of my living room. A sense of satisfaction washed over me as the rooftop image became hazy around the edges. My mind was my trophy; I valued it above all else. I am still in control, I assured myself, with focused concentration. My mental faculties are in tact. My head throbbed from the war raging inside, but finally the nebulous image began to fade. Breathing a sigh of relief, my eyelids fluttered open before my heart skipped a beat and I was precipitously pulled back into the vision before me. Jeremy had climbed up onto the ledge. Was he thinking about jumping? This strange hallucination felt so real that I was nervous about him standing in such a precarious position, with no barrier to protect him from falling. No, Jeremy, it’s not worth it! I mentally screamed, all thoughts of my living room gone. Gazing behind him, he shifted his feet in an attempt to climb down, having achieved his childish goal of re-enacting the famous scene from Titanic. I mentally chastised him for such reckless behavior. My palms were sweaty and my heart beat erratically; I needed to get a grip on reality. Shaking my head, I consciously slowed my breathing and tried once more to concentrate on my living room to break the spell I was under. No more wine for me. It felt like it happened in the space of a heartbeat. A bird swooped down towards his head. Although it never actually touched him, he was startled and lost his grip on the bottle. His natural instinct to reach for it caused him to lose his already tenuous footing. The look of sudden realization and depth of terror in his eyes pierced my soul. Desperately trying to regain his balance, he flapped his arms wildly. I couldn’t help but notice the irony that he resembled a bird trying to take flight; except, of course, he couldn’t fly. Subconsciously I had leaned forward, wanting to reach for him, but as I outstretched my hand, he disappeared. With a scream of horror I realised that he’d fallen from the ledge. Startled, I snapped out of the dream as my eyes refocused on my living room. Panting, I wiped the tears streaming down my cheeks. What had just happened? I looked around me, regaining my bearings. I struggled to think of a logical explanation for why my mind was playing tricks on me. The only cause I could think of was the evening’s mixture of wine and spicy food, compounded by a lack of sleep. Yes, that had to be it. No lasting damage. But why such a strange hallucination? Was my subconscious trying to tell me to pay more attention to Jeremy? That he was perhaps more vulnerable than I’d realized? If this was somehow an inexplicable result of repressed concern or guilt, I wanted to assuage it quickly. I looked at the clock. It was nearly 9:00 p.m. Not too late to go and check up on him, I thought. I’d invite him over this weekend. I went across the hall and knocked on the door of apartment 302. No answer. Perhaps he’d gone out or gone to bed early. I shouldn’t disturb him. But I knocked again automatically, as if some unknown magnetic force were pulling me towards the door. I could tell the light was on inside from the faint glow under the door. I knocked three more times. No answer. My heart thumped heavily in my chest and gooseflesh covered my arms. I told myself that I was being ridiculous, but that same gravitational pull that kept me at the door started pulling me towards the stairs to the roof. I shook my head, like that would somehow shake the ominous feeling I had. I trotted back to my apartment, only to stand frozen with my hand on the doorknob, fighting the urge to turn my feet back around. What am I doing? I scolded myself. I went in, and let the door shut behind me. I made it halfway to the kitchen before a chill crawled across my skin, making every nerve-ending tingle. Images of Jeremy on the roof assaulted me and turned my stomach in knots. This is ridiculous. But even as I thought the words, I turned and grabbed the cardigan lying on the back of the couch. As I climbed the stairs thinking about how creepy it would be up there in the dark, I assured myself that I only needed to take one quick look – and no one needed to know that I’d completely lost my mind. My heart rate quickened with each step, the echo in the stairwell reminiscent of a steady drum beat accenting the feeling of foreboding. More than once, I considered turning back, but my feet kept moving upwards, obediently marching to the drum. I justified the absurdity of the endeavor with the knowledge that unless I checked, I wouldn’t be able to get it out of my head. And what I wanted to do more than anything was to forget all about the events of the evening, go to bed and never order anything from Spicy Joe’s again. The door to the roof loomed in front of me, mocking, daring. The stairwell fell eerily silent. I tensed as I grabbed the handle, almost expecting to hear the crash of cymbals. Squaring my shoulders, I slowly opened the door, holding it ajar with my foot as I peered around it. One quick peek to confirm that I was totally insane and I was out of there. I couldn’t see anything in the darkness and with a sigh of relief turned to exit. As I did, I caught sight of a faint reflection. I stopped and squinted my eyes to try to make it out. Holy crap, there was something there. Someone there. My mind started racing. It could be a psycho serial killer peeping into the building across the street for all I knew. I certainly didn’t want to make his day by gift-wrapping myself on a darkened roof; just like all those horror movies when the blond cheerleader runs away from the exit and you think she’s so stupid she doesn’t deserve to live. But despite the fact that I wanted to run as fast as I could, my feet remained frozen. What if…? I could barely even think the words. What if it really was Jeremy? I was reluctant to go forward to investigate; if I let go of the door I might as well put on the cheerleading uniform and hold up a neon sign flashing VULNERABLE AND ALONE—COME AND GET ME. I shuddered at the thought. As I was deliberating my options, the man staggered, revealing a glimpse of his profile in the soft light reflected from the neighboring building. Seeing the bottle in his right hand, I gasped and a shiver ran down my spine. This was exactly the scene from my hallucination. Exactly. How was that possible? I swallowed. Possible or not, Jeremy was here. I pinched my arm to make sure that I was awake, then shook my head realizing how silly that was. I was here, and I couldn’t ignore the fact that Jeremy shouldn’t be alone. The darkness of the night enveloped him, the enfolding shadows a reflection of his inner turmoil. Despite not knowing him very well, I could tell he was kind and gentle, and right now, he needed a friend. I took a deep breath and removed my foot from behind the door. It slammed shut with a thud of finality, echoing through the cold night air. Jeremy jumped, whipping his head around to identify the source of the intrusion. “Is that you, Jeremy?” I called out, trying to sound casual, but the high pitch of my voice betrayed me. Close enough. “Yes, it’s me.” I tried to sound cheerful. “Wotcha doin’ up here?” he slurred. I wrapped my sweater more tightly around me. “I.. ah... sometimes come up here to look at the stars and think.” I walked up to stand next to him now, and could see him more clearly in the pale light. His thick dark hair was disheveled, and his usually well-kept facial stubble had grown longer. His tall frame towered over me but I noticed his hazel eyes were bloodshot. “I’ve never seen you up here beshore.” He furrowed his brow. “Before,” he corrected himself, annunciating the word carefully and looking proud that he’d managed it. He stood up straighter and nodded in understanding. I smiled to myself, impressed that I’d lied so convincingly given the circumstances. If Jeremy had known me at all, he’d know that this would be the last place I’d come, at night in the dark, unless I was carrying an Uzi and had five armed guards surrounding me. “What’s bothering you?” he asked, his eyes softening. Panic seized me; I hadn’t pre-empted that question. What was I going to say, that what was bothering me was the fact that I’d somehow ended up on the roof at night to find a neighbor I’d already mysteriously seen get killed, all from the comfort of my living room? Not even I could believe it, so how could he? I stuck with a watered down version of the truth, leaving out all the crazy. He probably wouldn’t remember any of this tomorrow anyway. I just had to distract him long enough to make sure that he had a tomorrow. Hansel and Gretel? Seriously? He wasn’t going to want to abandon his pity party to talk to an idiot who spoke about fairytales! I scolded myself. The next thing I’d tell him was that I was upset because I’d lost my shoe at midnight and my carriage turned into a pumpkin. Sheesh. If I was going to sound like an imbecile, I might as well have told him the truth. Nope. On second thought, I planned to never say that aloud. Ever. If anyone at my law firm heard that, they’d have me committed. He looked at me for a long moment, appraising me. I squirmed under the intensity of his gaze. He’d probably want to jump just to get away from the crazy neighbor in a minute. I needed a save. I decided to say something he could actually relate to. “So, mind if I crash the party? At least no one will complain about the music. But no re-enacting Titanic while I’m here; we know what happened to Leonardo at the end of the movie.” I laughed nervously, fidgeting with my hair. He raised his eyebrows and looked down at the phone in his hand. It was then that it occurred to me that I’d interrupted him about to put on the music. The only sounds on the roof came from the rustling of the wind and the distant noise of the traffic below. He looked at me curiously, cocking his head to one side. Okay, that was weird. I’ve just told him what he was about to do. How do I explain that? Think. I laughed again, and it sounded awkward even to my ears. I rushed on, trying to mask my embarrassment. “I mean, isn’t that what all you guys do? If it’s not re-enacting that scene from Titanic, it’s the one from A Few Good Men with Jack Nicholson telling Tom Cruise, ‘You can’t handle the truth.’” I paused, acknowledging my Jack Nicholson impersonation had bombed and this was going from bad to worse. Flushed, my nervous rambling kicked into overdrive. “And since we’re on a rooftop, the Titanic scene seemed the more obvious choice. You know, the ledge, the height, the view.” Shut up, shut up, shut up. The intensity of his gaze unnerved me. The momentary silence was disrupted with my continued babbling. Surprisingly, the silence was more unsettling than my maundering. “So, before I rudely interrupted, were you celebrating or commiserating?” Maybe I could get him to talk. A half-smile touched his lips. I took that as my cue, hoping he’d be more receptive to my eagerness to get off the roof. “I’ll tell you what. How about instead of swapping sob stories in the cold, we go back downstairs. You can come and hang out at my apartment if you like – we can watch some bad reality TV. That always makes me feel better about my own life,” I joked. Ordinarily I’d never let a guy I didn’t know into my apartment, but my instincts told me I’d be safe with Jeremy. "And call me Isy." He paused only a moment before answering. “Sounds good to me. You can call me Jez.” This time when he smiled, it reached his eyes.